JW Marriott Cancun Resort & Spa has completed its renovation, which includes a transformation to all 447 ocean-facing guestrooms and suites. 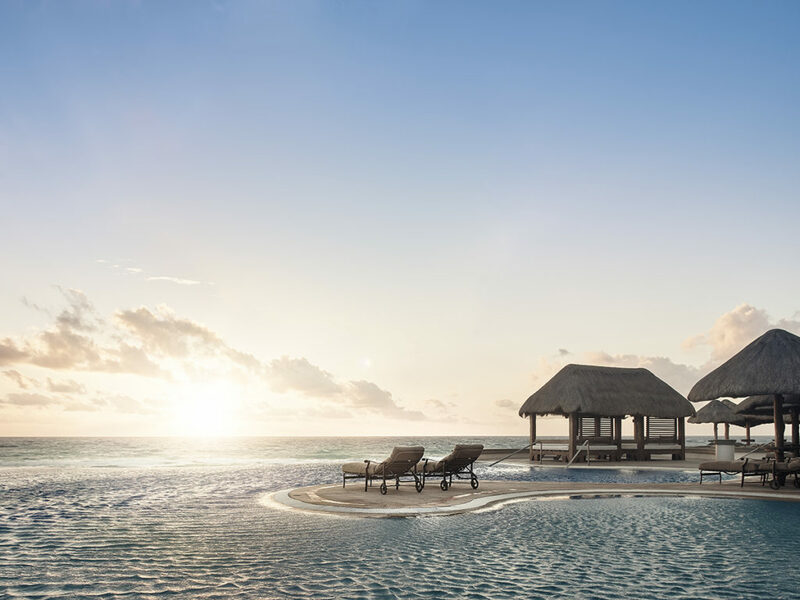 The hotel’s multimillion-dollar restoration embraces its beachfront location and introduces modern elements complemented by local Mayan flair. Martha Gaos and Claudia Gonzalez of G+G Interiorismo re-envisioned the interiors of JW Marriott Cancun using a combination of modern techniques, traditional elements and a vibrant color palette. Warm sand tones are punctuated with pops of bright turquoise that reflect the cerulean waters of the Mexican Caribbean, creating a sense of harmony with the hotel’s idyllic surroundings. Influenced by the rich culture of the destination, the hotel is furnished with pieces that incorporate traditional Mayan designs, including authentic Mexican textiles and reclaimed wood accents adorned with meticulously carved drawings, paying homage to the cross-stitched embroidery typically found in garments worn by the ancient Yucatan people. A closer look reveals intricate designs embellished with native symbols, including hummingbirds (sacred in Mayan mythology), quetzales (local birds), four-petal flowers, snail fossils, amate bark paintings derived from Mexican folk art and other emblems common in knitting patterns of local huipiles (indigenous garments). 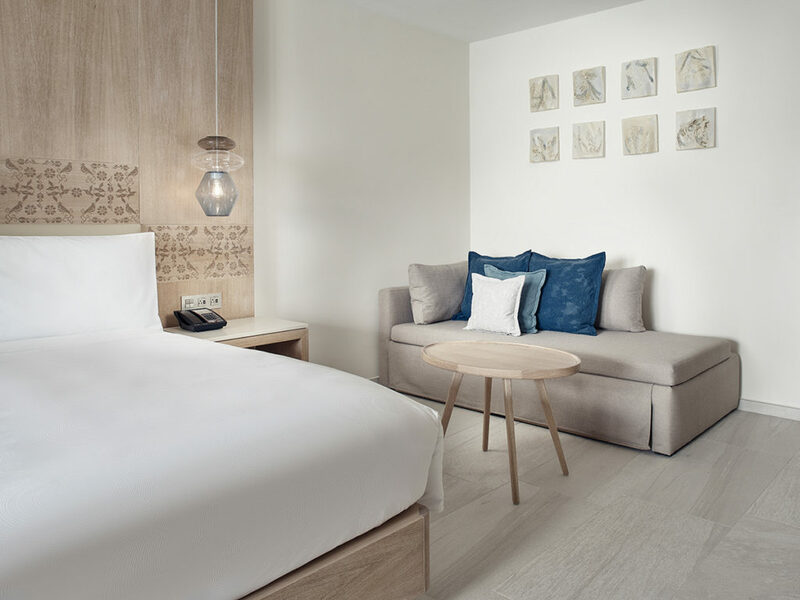 Local artisans created the herringbone-patterned floors using traditional materials, while the hotel’s redesigned bedrooms and bathrooms feature marbled, aerial-view images indicative of the Mexican cenotes (natural sinkholes) as a focal point. 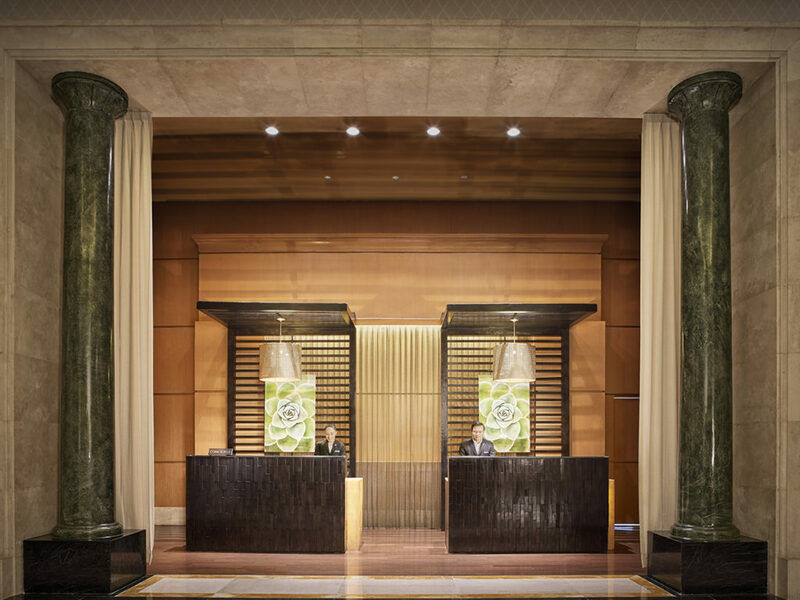 The 74 redesigned suites incorporate ‘wood screw’, a type of indigenous wood commonly used in the Yucatan Peninsula, along with architectural light fixtures, sand-colored curtains and textured rugs in muted tones, reminiscent of the coral reefs. Additional renovation highlights include modern, oversized bathrooms with freestanding soaking tubs, luxurious rainfall showers, dual sinks and granite vanity tops featuring chrome detailing. 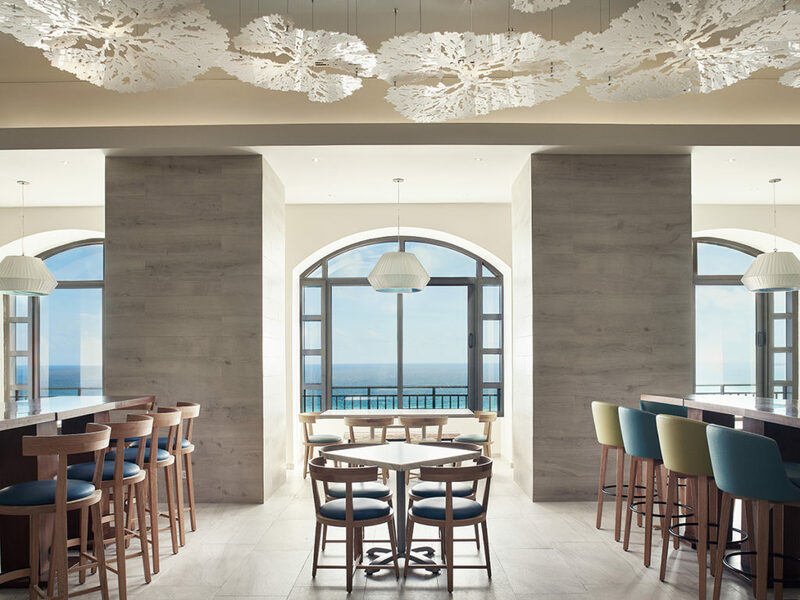 JW Marriott Cancun’s 4,000-sq.-ft. Presidential Suite features floor-to-ceiling windows, a full kitchen and airy dining room, and is complete with beautiful oak detailing and ceramic tiles curated by renowned Spanish designer Patricia Urquiola. In addition, the hotel’s updated Club 91, located on the 14thfloor, evokes a mod-style that sets the scene for relaxation and socializing. 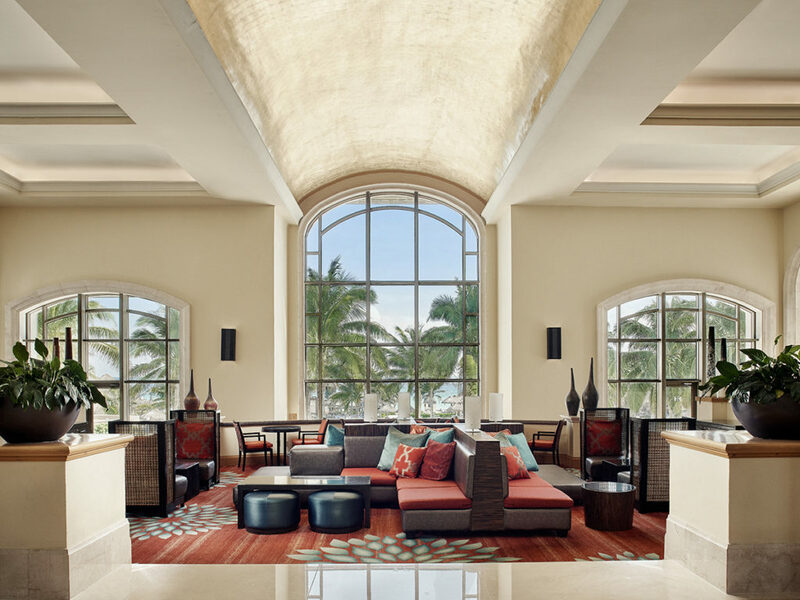 The inviting new space has navy blue and olive-hued chairs in combination with coral reef ceiling decor, providing guests with a glimpse into what lies beyond the hotel’s shores. Club 91 also showcases new interactive culinary experiences and open communal table concepts, encouraging guests to mix and mingle.